A book that can help finances in just 30 days. It must not require more than five minutes input (on average) a day. It cannot cost anything to implement and ― as much as possible ― should not involve phone calls. Each day something must have been achieved or implemented. By the end of Chapter One, it must have returned beyond its value. You may or may not be aware of The Pareto principle, better known as the 80:20 principle. In simple terms it implies that 80% of your results come from just 20% of your efforts. This rule can be applied to nearly all areas of your life and certainly holds true when it comes to your personal finances. Whether in terms of saving money or making money, most of your rewards come from the initial effort when dealing with your finances. The key is to focus on that 20% that yields the most results. After that the law of diminishing returns kicks in. The world of technology has moved much faster than the world of finance would like you to believe. There are brilliant online solutions to most financial problems if you know where to look and how to use them. So you will find this book full of references to smartphone apps and online tools that can help you make a difference and let you get on with your life. But it’s not just about apps and websites; I also include tricks and techniques I’ve developed myself over the years. The Pareto Principle (better known as the 80:20 principle) implies that 80% of results come from just 20% of efforts. This rule can be applied to nearly all areas of life and certainly holds true when it comes to personal finance. The 30 Day Money Plan uses this principle to help you get the best return on both your financial and time investment. Damien is a widely quoted money and investment expert in the national press. He created MoneytotheMasses.com while working in the City when he became disillusioned with how the public were left to fend for themselves as they could not afford financial advice. For years I’ve often thought what good is having a string of financial qualifications if I only help a handful of very affluent people who can afford my services? It is my belief that no matter how much you earn your finances are just as important as the next person’s. 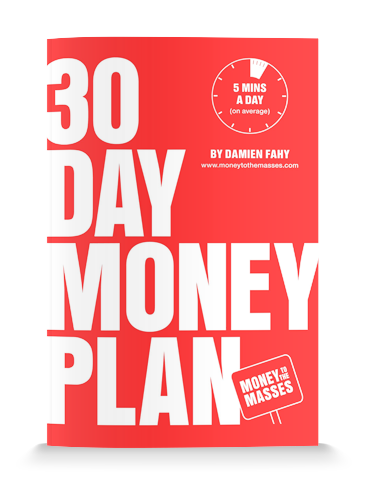 Fill in your email address to receive your free copy of The 30 Day Money Plan as well an email with new updates.